If we’re in a free-form jam and someone performs a realistic scene…what should we do? What kind of scenes go well together? When should we repeat a pattern of pea in a pod scenes. How many character driven scenes should we explore? What pace should these scenes be? In this workshop we will explore the underlying mechanics of “the deconstruction” and attempt to patternise different scene types. 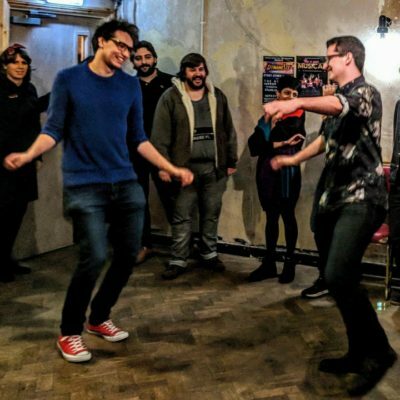 Theo Worsley began improvising with the University of Bristol’s Improv Society in 2013 in order to do “theatre stuff without the chore of learning lines”. Since then he has fallen in [strong feelings] for improv and comedy. With them Theo travelled to the Edinburgh Festival Fringe three times in directing/performing roles, performed in a 5* improvised Roald Dahl show, and countless other performances. In his final year of uni, Theo started getting involved in multiple other improv projects outside of the improv society (Real Positive Poles, Eat Pant, Throwback, No Scrubs). Nowadays, Theo teaches with Kitchen Rules Theatre where he is the Marketing Director. he is also part of Improv troupes: Real Positive Poles, The Inheritance, Hot Take, Last Day on Earth, and The Faculty. Theo still enjoys learning all things improv and has been taught by improvisers all around, such as: Lydia Hensler, Jonathan Pitts, Rebecca Macmillan, Susan Harrison, Carleen Macdermid, Philip Markle, Katy Schutte, as well as other well versed Brizzle improvisers. He believes in loving/trusting your scene partner, supporting big choices, and having fun.